Home Apps News Promos Shopee Smartphones Shopee Launches Gadget Zone; Offers up to 92% Off! 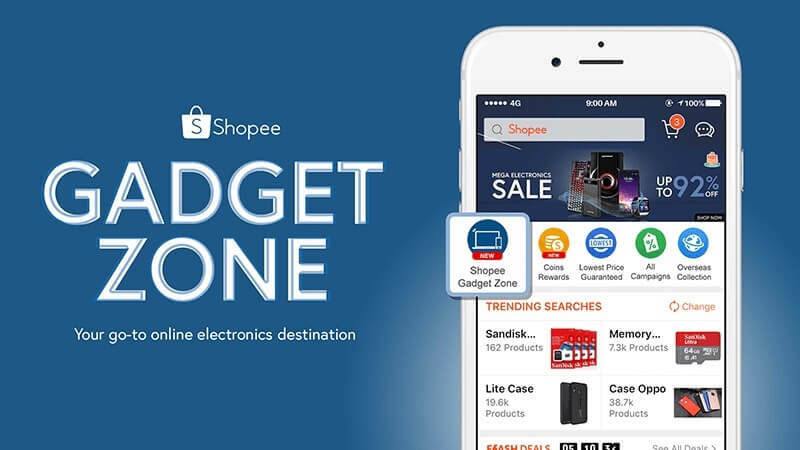 Shopee Launches Gadget Zone; Offers up to 92% Off! Shopee has introduced its new in-app feature – the Gadget Zone. With this new offering, Shopee brings all the best tech promos ranging from home appliances to mobile phones in a more convenient and organized way. In addition, various products from big tech brands are also up under this portal. To kick off, Shopee announced its Mega Electronic Sale beginning July 17 to July 20. The promo offers up to 92% discount on electronic products from big companies, including Samsung, OPPO, Xiaomi, Vivo, Philips, Canon, HP, and JBL. The fun isn’t over here yet, as the e-commerce platform revealed that 22 shoppers will be picked from the pre-registration of the Vivo X21 to bring home a Php10,000 voucher each to purchase the said handset. Meanwhile, the vouchers may only be used until July 31. “With the rise in popularity of electronics in the Philippines, we also see Shopee users looking for more premium tech products for their daily use. Hence, we feel now is the best time to introduce Shopee Gadget Zone in our goal to become the one-stop online shopping destination for all Filipinos. With Shopee Gadget Zone, locals can save even more on top-of-the-line products via exclusive deals, bundles, and various promotions. This follows Shopee’s promise to deliver an excellent online shopping experience to users through campaigns and features that meet their evolving needs and preferences,” Jane Lim, Director of Shopee Philippines, addressed. See Also: Samsung Galaxy J4 (2018) Now Available Online; Priced at Php9,990! For more info about the Mega Electronic Sale, click here.